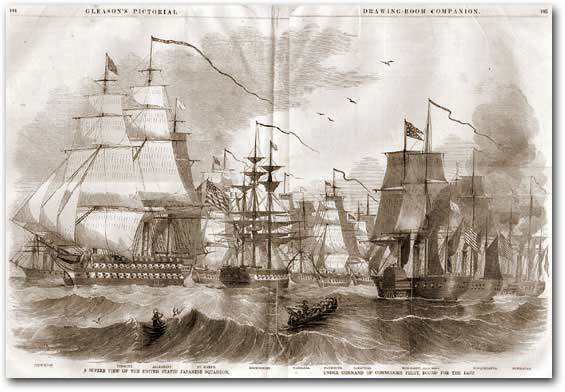 (the Mississippi and Susquehanna) and two sloops, with a total complement of 65 guns and a little less than 1,000 men. 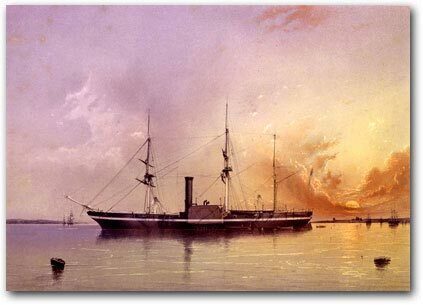 When he returned the following year, his armada had grown to nine vessels, with the new flagship Powhatan joining the other two paddle-wheel warships. The crew had almost doubled to around 1,800, and mounted cannon now numbered over 100. 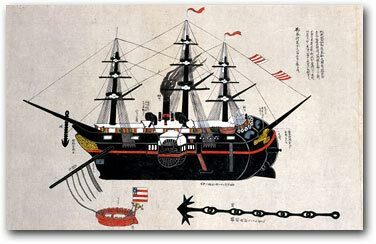 In Japanese parlance, the American vessels quickly became known as the “black ships”—probably from the color of their hulls, although it is sometimes said that the label derived from the clouds of smoke that hovered over the coal-burning ships. 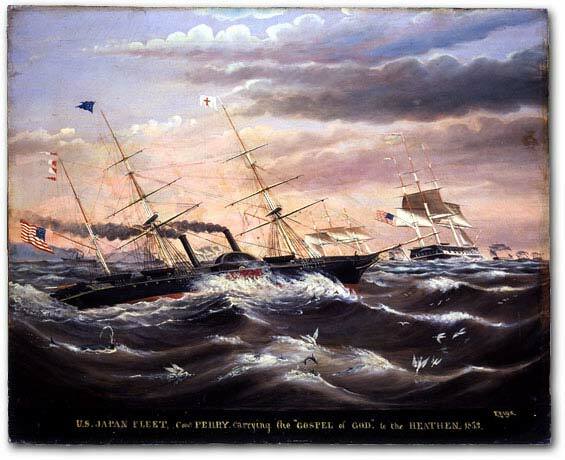 Perry himself had played a major role in mechanizing the U.S. Navy, and the new steam technology persuaded all who saw it that the world had entered a new era. When his oldest steamer, the Mississippi, was launched in 1841, its huge engines were described as “iron earthquakes.” On the 1854 mission, the Mississippi consumed 2,336 pounds of coal per hour, while the corresponding figures for the less efficient Susquehanna and Powhatan were 3,310 pounds and 3,248 pounds respectively. To conserve fuel, all of the steamers hoisted sail as well. Japan’s adoption of the “closed country” policy in the early-17th century involved not merely keeping foreigners out, but also keeping Japanese in. Thus, severe restrictions were placed on shipbuilding, and maritime activity was restricted to sailing small vessels in coastal waters. 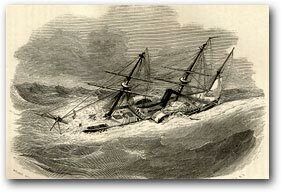 An illustration in the official narrative of the Perry mission depicted one of the single-sail “junks” that patrolled the waters outside Edo. 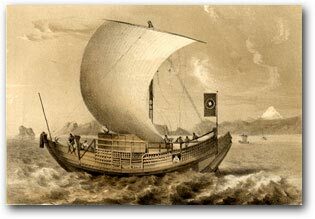 Even as pure sailboats, such modest vessels obviously could not compare with the great multi-mast ships of the foreign powers. 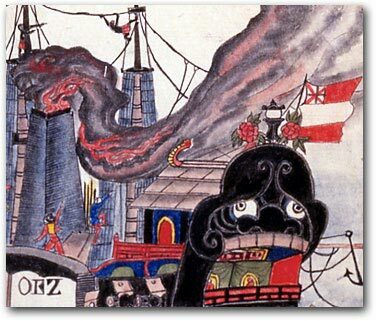 Add steam engines and a battery of cannon, and it was all the more painfully apparent how far behind Japan had fallen during its long seclusion. This dramatically imagined rendering of Perry’s squadron appeared in the February 12, 1853 issue of Gleason’s Pictorial. Perry is being rowed to his flagship on the first voyage, the steamer Mississippi. In fact, the 1853 mission was comprised of only four ships. painting (named after the British artist Joseph Turner, who died in 1851). 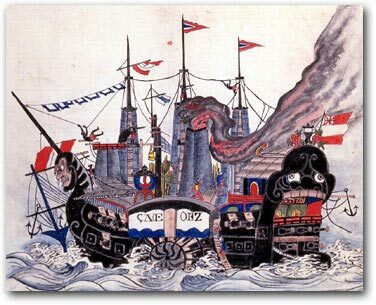 Perry’s own artists captured the fleet both at rest and in turbulence, but the most provocative rendering of the black ships at sea came from a painter back home, who added a banner legend to his own imaginary artwork to remind Americans that the commodore’s true mission was literally divine. Perry himself usually spoke in terms of showing the flag, opening the doors of commerce, and spreading “civilization” to a backward people. One person’s god may be another’s demon, of course. 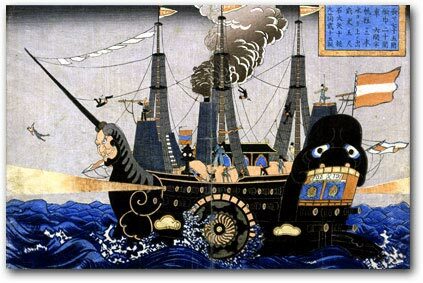 In this regard, Japanese artists also gave free rein to their imaginations by depicting the steam-driven black warships, almost literally, as Darkness Incarnate. In the best-known print of this sort, the ship’s hull is pitch black, smoke belches from its funnel, the figurehead on the bow is a leering monster, portholes high in the stern glower like the eyes of an apparition, the ship’s sides bristle with rows of cannon, and gunfire streaks like a searchlight from a gun near the bow as well as from another, unseen, at the stern. Although woodblock prints as a genre were popular illustrations never intended to be confused with fine art, the detail of this demonic rendering reveals several aesthetic touches characteristic of traditional Japanese design. 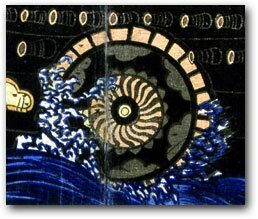 We see this in the stylized curves of the waves and filigreed rendering of whitecaps and splashing water, for example, as well as in the distinctive pattern of the ship’s paddle-wheel. In a demonic sister ship that was part of a larger painted montage, many of the same features are present—and a touch more. Here smoke from the coal-burning engines is streaked with forked tongues of flame. 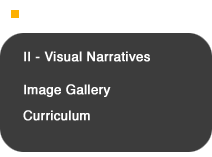 To knowledgeable Japanese, these might well have evoked classic artistic depictions of the fires of hell and the conflagrations that consumed palaces and temples in an earlier era of civil wars. Like the blue eyeballs seen in occasional renderings of Perry and other “barbarians,” however, even the demon ships are more complicated and nuanced than they appear to be at first glance. Take, for example, the rendering of the stern of the vessel: in each of these graphics, this clearly has been turned into the eyes, nose, mouth of a monster. Is it not obvious that this is meant to reflect the monstrous nature of those who came with the ship? In fact, this is not so obvious—for Asian seafarers of the time sometimes placed huge demonic faces on the sterns of their vessels to ward off evil spirits and ensure safe passage. 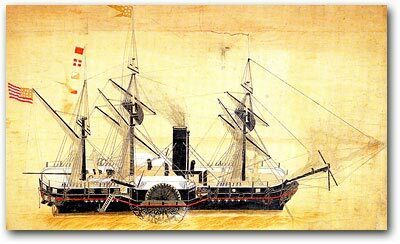 Despite the seclusion policy, a number of delegations from Korea visited Japan during the Tokugawa period, for example, and we know from Japanese scrolls depicting these missions that the Koreans themselves protected their fleet with fearsome markings of this nature. 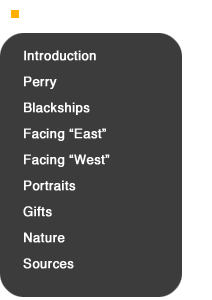 Could this have influenced these particular Japanese artists who sought to tell the populace about Perry’s black ships? We cannot say. Most Japanese renderings of the black ships were more straightforward, in any case, and provide a small but compelling example of how pictorial “realism” may vary depending not only on the viewer, but also on the medium of expression used. The handsome oil painting of the Powhatan in Charles Beebe Stuart’s book, for example, was almost a mirror image of the formal photograph of that vessel—and yet worlds apart in its ambiance. Japanese artists also portrayed the Powhatan and other black ships “realistically,” from the same perfect-profile perspective—and yet conveyed an entirely different impression. 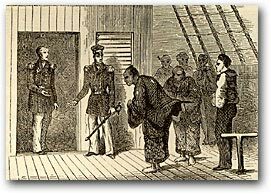 Perry’s strategy of simultaneously impressing and intimidating the Japanese included inviting some of their representatives to tour his flagship. 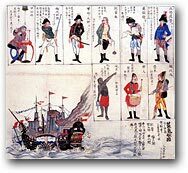 This made possible a small number of on-deck and below-deck depictions of the details of the black ships. Other artists, meanwhile, rendered the foreign intrusion from afar with panoramic views of the American squadrons anchored in Japanese waters. 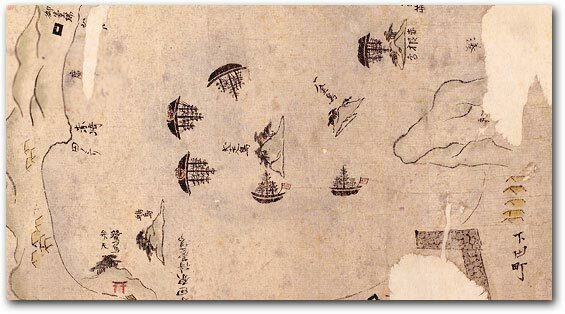 Such graphics, done in both color and black-and-white, often were designed to convey detail concerning not only the black ships but also the surrounding terrain. Six of Perry’s gunboats rest at anchor. Place names (and ships) appear rightsideup, upsidedown, and sideways—a convention that developed from maps being rotated as they were read.